In the earlier blog of this blogpost series we have installed the necessary tools to build a cross platform mobile application in java. In this blogpost, we will create a cordova android project and configure it in eclipse. Earlier Cordova library by default has all the APIs supported by Cordova even if they are not used in your project. This resulted in unnecessary upgrades; huge file downloads to client etc. The recent release of Cordova addresses these issues. This release provides 2 new tools, Cordova and plugman. Both of these are implemented using NodeJs and so are distributed via npm. The Cordova command line tool unifies all platforms supported by Cordova into a single project structure. And plugman provides automated discovery, installation, and removal of core plugins provided in Cordova itself in previous releases and also custom plugins from git. Follow the below steps to create a Cordova-Android project. Install nodejs from the below link, if it is not already installed on your system. Download the installer, and double click on the installer. The installer provides guidance on the next steps to install. Once the installation of nodejs is completed, open command prompt and type the below command to check the installation. It should show some version number like 1.3.8, if nodejs is installed correctly. If nodejs is installed, run the below command to install cordova. It will take some time to download the required packages and complete the process. Then change to the working directory to the project directory. So I have created a cordova project for Android. After adding the android platform, Run the below command to build the App. Launch the eclipse IDE and select New Project. 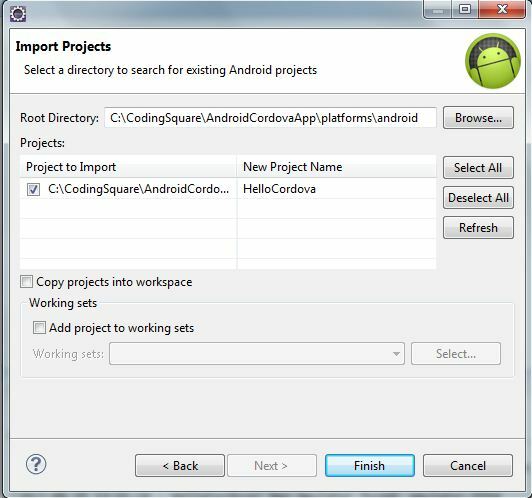 Select Androidà Android Project from Existing Code in the ‘New project’ window and click on Next. After importing the project, you may see some compilation errors like the below ones. error: Error: String types not allowed (at 'configChanges' with value 'orientation|keyboardHidden|keyboard|screenSize|locale'). The following compilation errors are observed intermittently. Ideally the project should compile without any issues. But looks like, there are some issues with the latest version of cordova. If you don’t see the below compilation errors, just ignore the below steps and continue. If you also observe the compilation errors like me, follow the below work around and vote to prioritize this issue fix to higher. Right click on the project, select properties à Android and select the latest Android API version. If you project has the below compilation errors, then please follow the below steps to resolve them are skip the below steps and launch the project. These errors are seen if cordova-3.0.0.jar is not available in libs folder of the project. If the jar is already available, then these error wont occur. You need to download Cordova Android code from the below link. Then run these commands to build cordova-dev.jar. Alternatively you can download the jar from the below link. 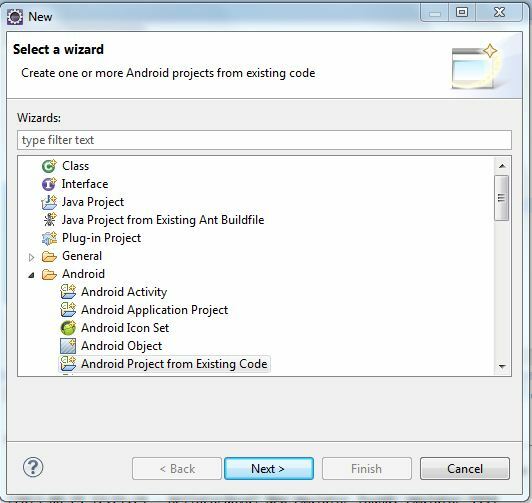 Copy cordova-dev.jar to libs folder in the Android project in eclipse and add it to the project classpath. Now all the compilation errors will be resolved, and the project will compile successfully. Now we will create an Android emulator. Run AVD Manager from programs. If there are no Android emulators configured, the AVD Manager screen will look similar. Click on New to set up a new Android emulator. Select the Android version you want to use and provide a name for this Android emulator and click on 'Create AVD'. This will create an Android virtual device. Once a virtual device is added, you can see it in AVD Manager. Now we will launch the Cordova Android project we created from eclipse. The Android emulator we have created will be launched by eclipse. Then the eclipse installs the application created using cordova in the emulator and launches the application. If the application launches successfully without any issues, then the android emulator should show similar screen. Since we haven't really coded any thing and the application deployed is just a blank project, cordova screen is displayed. We can later modify this with our code. What do i really do at this step ? good article, thanks. I have a better understanding now of how phonegap apps are structured. I think phonegap has now been updated so some of these steps aren't needed. Some of the steps here are to address the issues while creating new Cordova projects.These issues are resolved on the latest versions of Cordova and so may not be required. But the actual steps(excluding the steps which are work around to the issues) remain same. Thanks for barcode scanner implementation. I think we need to know what the problem is, to explore a solution. If you still face the problem, you can email me the problem. I can see if I can help. "An error occured while listing Android Targets at C:\Users\..........\lib\android\cordova\3.4.0\bin\lib\check_reqs.js:87:29". Also please note that there is a message "cordova library for "android" already exists.No need to download.Continuing ... "
May be the download is not completing. Can you checking if there is proxy or some thing in the network that is blocking the download ? I've installed cordova and open with eclipse. But when I change the code of index.html and run it the app. The changes not appear..always "Device is ready" page appear. Where is the index.html file that I have to change? Could you help me? I was having the same issue and it looks like I resolved it. I'm running an Android app so I had to run the command "Cordova build android" in the project's directory, apparently you need to do that for every individual platform or else the code won't sync or something. All I know is it works! Thanks. I could resolve most of my cordova on eclipse setup issues reading your blog. I have problem to add android platform. Once run 'cordova -d platform add android', it just stop at running command create.bat. Not progress at all. Any reason why ? Can you send me a screen shot of the issue? Thanks for the tutorial, I was needing a step-by-step like this. I think creating a fully functional app is a very big exercise itself. I don't think it can be done in 1-2 blog posts. It requires a series to create a fully functional app since it involves lot of activities like deciding the app which I want to create, analysis, design, setting up environment, coding etc. But I think it is worth it. I will keep it on my list of things to do. But it will take some time. Thanks for the suggestion. No, the jar file will change with Cordova version. But this issue seems to be addressed in the latest versions. I haven't seen this issue recently. Hello there, thank you so much for the tutorial. 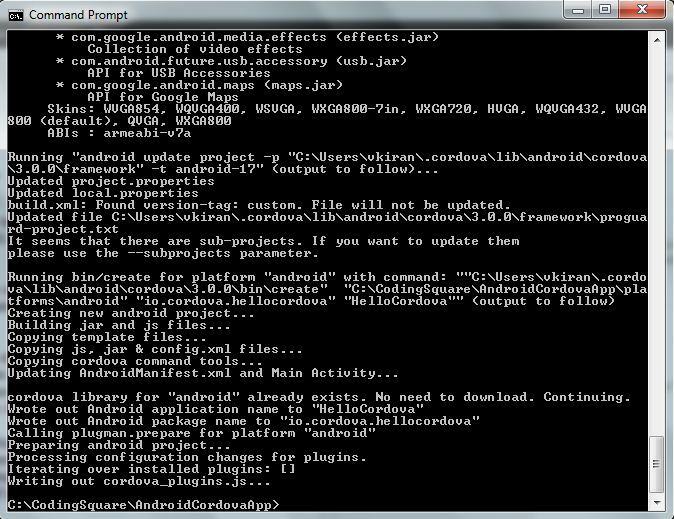 I followed the steps and found an error in the step of adding the platform using this command "cordova -d platform add android". Downloaded, unzipped and extracted 2198164 byte response. Do you mind please to help me to the next step so I can Launch the eclipse IDE and select New Project? This error is because Ant is not installed on your system. Download and configure Ant, and then try creating the project, It should work fine. I will updating this in a couple of days. I am not able to execute the command cordova -d platform add android . I get the result "
node is not recognised as external or internal command"
You need to install nodejs before using Cordova CLI. The instructions for installing nodejs are in the below blog. Venkat i already have node js installed . I have created the AndroidTest in same folder as that of node. Than also I am getting the error. Also I have also executed the other commands like plugman using node only! Then you need change the directory before running further commands on that project. Hi Thanks For the tutorial, But am Getting only "connection To Device" message not "Device Is Ready", am added cordova-dev.jar file from dropbox link given above.What is the issue now? ?